The Rise of a Party-State in Kenya From Harambee! to Nyayo! Although Kenya is often considered an African success story, its political climate became increasingly repressive under its second president, Daniel arap Moi. Widner charts the transformation of the Kenya African National Union (KANU) from a weak, loosely organized political party under Jomo Kenyatta into an arm of the president's office, with "watchdog" youth wings and strong surveillance and control functions, under Moi. She suggests that single-party systems have an inherent tendency to become "party-states," or single-party regimes in which the head of state uses the party as a means of control. The speed and extent of these changes depend on the countervailing power of independent interest groups, such as business associations, farmers, or professionals. 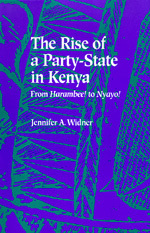 Widner's study offers important insights into the dynamics of party systems in Africa. Jennifer A. Widner is Associate Professor of Government at Harvard University.